I've been coming to Noosa for as long as I can remember my young adult adventures. Now it's time to have some more adventures with our beautiful young family. We arrived on Friday and were greeted with a blue sky and loads sunshine. I received a gorgeous vegan hamper from Providore with beautiful beetroot cashew dip, the best ever olives I've ever tasted, a fig and walnut rolada and of course my favourite Pana Chocolate. Yum! My friends at Ocean Breeze Resort always reserve our favourite room and it's such a convenient location just on Hastings St.
We couldn't have asked for a perfect weekend. The girls loved playing around the pool and seeing the sun sparkling in the water. The surf was cranking and the boys and girls loved catching these perfect peelers. Adrian managed to catch the wave of the day. 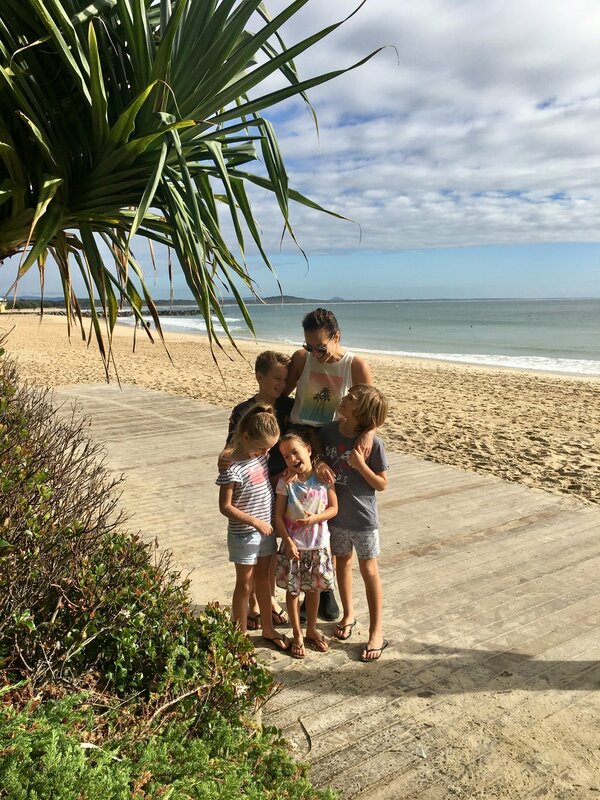 Not to mention the amazing fresh Noosa markets and local produce we were able to make our delicious meals in our apartment to fuel our fun filled days. Wash tomatoes, cucumbers and brush mushrooms with a paper towel and finely slice. Arrange olives, falafels and the rest of the produce on a plate, smash avocados on French bread sticks and self serve. So many wonderful sights to see while you're in Noosa and our new friends Danielle and Steven took us on this epic hike to Mt Tinbeerwah. It was truly breath taking. "The world is your sandbox, build the most epic sandcastles anyone has ever seen". All in all an epic getaway and we can't wait to visit Ocean Breeze Resort for more adventures magical moments. I had such a beautiful and memorable Mothers Day weekend. "To the world you are a mother, but to your family you are the world".